Lentils are small, lens-shaped seeds, commonly referred as pulses. They are one of the ancient cultivated crops which probably originated in the Central Asia and Turkey. Binomially, the seed pods belong to the Fabaceae family, in the genus: Lens. Scientific name: Lens culinaris- Medikus. Lentils (masoor dal), whole (sabut), and split and hulled orange dal. The lentil plant is an annual, low spreading small shrub. It is a cool season crop and grows well in clay-loamy soils. The short, flat and oblong pods contain 1-2 seeds. Lentils can vary in shape, color, texture, and flavor, depending on the species. They broadly divided into two groups, according to their size. The large lentil (macrospermae) and the small lentil (microspermae). The Egyptian or red lentil has no skin and is smaller and more round. Lens esculenta puyensis (Le Puy green or the French green lentil), also known as Puy lentils, is a protected crop cultivar recognized for its rich flavor and taste. Puy lentils remain quite firm even after cooking. Lentils indeed carry almost the same calories and potein as that of large beans. 100 grams of lentils hold 352 calories and 24.63 g or 44% of recommended daily values of protein. Lentils are cholesterol-free, low fat pulses which is good for heart and vascular system. Unlike other large size beans, lentils compose relatively less amount of dietary fiber which makes them easier for digestion and work well for those suffering from flatulence and inflammatory bowel disease. They compose small quantities of isoflavones and pro-anthocyaninidin dimers. Isoflavones in the diet has been found to reduce post-menopausal cancers and osteoporosis. They are guten-free food items which appeals to those suffering from gluten-allergy and celiac disease. Lentils carry proportionately more B-complex of vitamins than some beans and peas. At 479 μg or 120 % of daily recommended values of folates, they indeed are the highest folate containing legumes. Folate, together with vitamin B-12, is one of the essential co-factor for DNA synthesis and cell division. Adequate folate in the diet around conception and during pregnancy may help prevent neural-tube defects in the newborn baby. Additionally, they compose very good levels of many B-complex vitamins such as pyridoxine-42%, thiamin-76%, pantothenic acid-43%, riboflavin-16%, and niacin-16% of daily recommeneded values. Most of these vitamins works as co-factors for the enzymes in carbohydrate, protein, and fat metabolism. 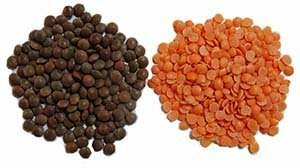 Lentils are a moderate sources of minerals unlike some beans like Adzuki beans. Nonetheless, they are particularly rich in iron at 6.51 mg (84% of DV) and copper-0.754 μg (109% of DV). Iron improves memory power, cognition and help prvent anemia. Copper required for cellular metabolism and blood cell production. Some other minerals in modest quantities in them are calcium-3.5%, magnesium-12%, zinc-30%, and phosphorus-40% of DV (daily values). They also good source of potassium; 677 mg (14%) per 100 g. Potassium is an intra-cellular electrolyte. It helps in countering pressing effects of sodium on heart and blood vessels. In the US, large seed-Brewer cultivar type is preferred in the recipes. In the markets, whole, split, hulled lentils packed in bins or packets sold year round. Elsewhere, small, orange masoor and brown lentils are used in the cooking. In the stores, buy dry seeds packed in air-seal packets and bins. At home, store in a well ventilated place, away from moisture and direct sunlight. Lentils do not need soaking. Wash carefully, as they often contain small grits and sand. Avoid cooking lentils for too long, as this turns them into a puree. While cooikng, add little oil; this prevents the formation of scum, which can block the safety and pressure valves. Lentils cook more easily if added to boiled water. Boil for 60 min for brown lentils and 15-20 minutes for orange ones. In the pressure cooker, cook 15 -20 min for brown lentils and about 5 min for orange lentils. 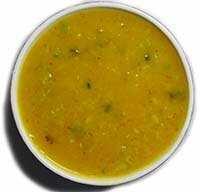 In India and Nepal, whole (sabut) and split masoor dal widely used in the lentil-dal preparation which is served over rice. Lentils used to prepare nutritious soups; they are also used in salads and main dishes. Boiled, mashed lentils often used to make croquettes. In India, lentils and rice are often prepared together (dal-kichri). They can be sprouted or made into flour, to make flatbreads and protein supplements. Dal adasi is a southern-Iranian spicy red lentil stew served over rice. <<-Back to Legumes from Lentils. Visit here for an impressive list of vegetables with complete illustrations of their nutrition facts and health benefits.